Compared to many, I am a relative latecomer to works on the 12k label (within the last 5 or 6 years), but I have listened to experimental, acoustic/electronic and improvised musical works for decades. Having missed other recent chances to see artists’ work that I admire in a live setting, I was quite pleased that the stars aligned last night to see Taylor Deupree and Marcus Fischer perform in an intimate and comfortable setting at the Spectrum NYC on Ludlow Street in Manhattan as the final part of The Cellar and Point Presents series. My elder son also came along–it was nice to share the event with him. The type of work I do often involves long spans of time between inspiration and tangible result, months and frequently years. So, being able to witness creativity translated into a reality in a comparatively short interval is pleasantly stimulating. Mostly I’ve seen it in jazz collaborations or rock music solos—taking a true creative risk and watching the outcome unfold and evolve (although the latter is often pre-scripted these days). Deupree’s own work I know primarily through his 12k label and I have reviewed a number of his label’s albums here, and Fischer’s with various collaborations and solo works on a number of labels including Tench, Kesh, Optic Echo, Flaming Pines, 12k as well as self-released. Aside from their live performance with Corey Fuller, Tomoyoshi Date and Simon Scott on the 12k CD Between, Deupree and Fischer also collaborated on a studio project in 2011 entitled In A Place Of Such Graceful Shapes (and I was VERY fortunate to find the gorgeous original limited edition release thanks to a referral from Marcus Fischer who spotted a lone remaining copy at Beacon Sound in Portland, Oregon a couple of years ago). I’ve been trying to find the text source, but I recall Taylor Deupree advocating that musicians of electronic or experimental works avoid using their laptop computers as primary music generators at performances, recommending artists create sound in the moment via other methods, rather than playing prerecorded sequenced works. Live performances need not be perfect, and sometimes fascinating things come out of failure or happenstance. Last night’s performance lasted a bit more than an hour (audio and video were recorded by Joseph Branciforte of The Cellar and Point), and was a sonic journey that could have fallen unexpectedly to quirks of some rather complicated equipment set-ups (see photos below), but the back-up plans in place were not needed at all. Initially, Deupree and Fischer spent about 15 or 20 minutes recording and layering sounds and textures loosely reminiscent of Graceful Shapes with percussion, melodic instruments, bows and various effects before branching off and working, more or less, independently of each other yet still curiously bound together. At about 40 minutes, both added new sounds and effects to take the performance into an alternate realm (Deupree being somewhat freer in applying contrasting textures). 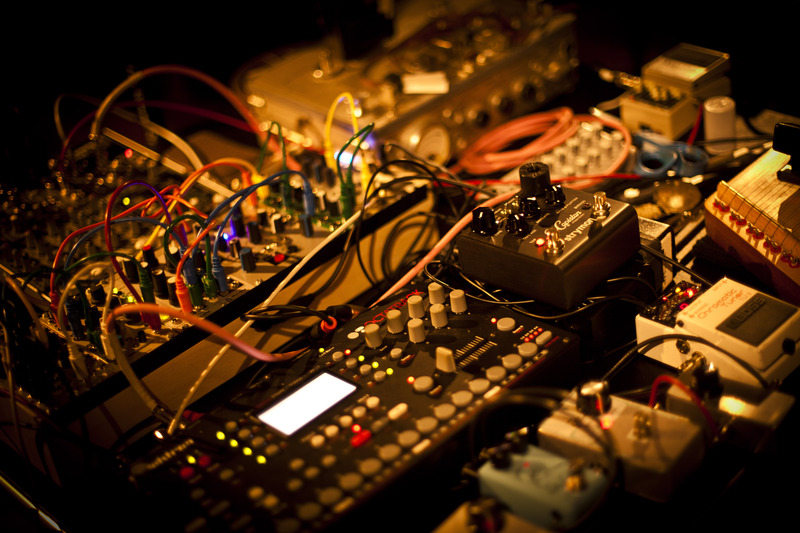 After the opening, Deupree’s sound creation and processing were primarily via electronic means, adding sounds from his modular synthesizer and shifting resonances between the channels of Spectrum’s surround-sound system. Whereas Fischer used largely acoustic instrumentation, plucking strings, bowing (actual bow and E-bow), tuning forks and other objects to add layers and textures. Before long, sounds that started as staccato percussives sounded more like fluid, perhaps akin to an ocean or at a shore, and light breezes mixed with occasional Manhattan street noises (the happenstance). Fischer, who also works with tape loops (such as his recording At Frame) had a vintage tape recorder with an expanded trapezoid of magnetic tape stretched between microphone stands to supplement the fabric of sound. Fischer would at times modulate pitch by physically moving the tape (also, watching the tape splice pass across the stands was rather hypnotic). Only occasional glances between Deupree and Fischer occurred as the piece developed, no words exchanged, just the sounds they created that filled the space. At an appointed moment, Fischer snipped the tape loop, it unraveled, and the music gradually faded into the night. It was an inspiring and soothing diversion from the realities that compete for space in an overly active mind, and Taylor Deupree and Marcus Fischer’s performance gives me hope that in an age where ceaseless media, noise, and clamoring for wealth and power dominates many of our collective daily experiences, it is possible to remain true to a more peaceful and well-crafted vision while remaining spontaneous and creative in a quiet timelessness. ILLUHA’s new album is a more introspective progression from their previous works, some of which have been recorded in large spaces with vast natural reverberation (like their last studio album Shizuku – 12K1067). Akari is like the successively magnified views in Charles and Ray Eames’s film The Power of Ten, while still being in the dome of the sky, the experience of the sound moves inward, and despite being ever closer to the point of focus a vastness of even more detail is revealed. The album has a comforting intimacy, and from the first quite unexpected (to me!) muted acoustic guitar harmonics there is also a deeply tactile quality. The instrumentation on the album is diverse, but it never distracts; each sound or ensemble has the space it requires and it tangibly enhances the experience. The recording is profoundly crystalline and as one meanders through the scenes there are moments of illumination to be discovered…finding light in the darkness where color and detail are exposed. The broader ambient sounds that open many of the tracks are subtle (like The Relationship of Gravity…) forming a backdrop for the journeys that Corey Fuller and Tomoyoshi Date lead us through. I think the quality of sound-light in some of the passages of Akari is like the photo below that I took on a walk, early in the Fall of 2012. Find a comfortable place to rest and get lost in this. One of my favorite ILLUHA pieces is a live recording from their CD Interstices (see the excerpt of Interstices III below, CD also available from 12k). Since the middle of 2011, Berklee College of Music professor, percussionist and Blue Man Group alum, Steve Wilkes has been working on a project to capture the sounds of Cape Cod over a year and to map those sounds as an aural history of the region (the far eastern end of Massachusetts in the northeastern United States). The project was funded in part by the Newbury Comics Faculty Fellowship. The region has undergone many environmental and man-made changes, from rising sea levels and coastal erosion to residential development. It was Wilkes’ feeling that the region is measured and analyzed in many ways (like bird population counts, temperature and sea levels), but there was yet to be a base-line environmental sound analysis examining animal, environmental and cultural activity in the region. At this point, the project consists of 3 CDs: 1, a collection of regional sounds; 2, the sounds remixed by a number of musicians who will be familiar to many, and 3, a song-cycle inspired by the region at various times throughout the year (which also incorporates many of the environmental sound recordings and the detailed credit links give an excellent overview of the variety on-location recordings). The album artwork evokes pleasant memories of worn edged blue-green beach-glass. CD 1 is a sonic time capsule, and at first it reminded me of a number of sound effects and spoken word recordings of the 1940s and 50s, and for a brief moment, I thought I was hearing a snippet of the old records by Bert and I. It also had the immediate effect of taking me back in time to the days when I summered on “The Cape” as a child with my parents in the early 1960s. The documentation of the region also harkens back to some of the expansive sound archive work by Alan Lomax. This CD chronicles the sounds of land, water and activities that mark the course of a year from a First Night Noise Parade to the calming summertime beach surf. It closes with the reading of the poem Route Six by Stanley Kunitz (being the road that travels down the center of the “flexed arm” of Cape Cod, reaching out into the Atlantic Ocean). Having lived in a beach-town region in nearby southern Connecticut, I am also reminded that a resort region like The Cape has two lives—the times when the summer-folk occupy and the off-season when only the locals remain. The off-season is the time when locals can take long walks on the shore beaches and see very few people. Life goes on in a different way after the tourists have left in the autumn. CD 2 is a sensitively created set of interpretive remixes by many well known artists in the current electro-acoustic, ambient and electronic music communities (see list above). The field recordings from CD 1 are delightfully co-mingled with the offerings from each of the artists (well documented at the web link also noted above). I was immediately struck by the opening notes of the first track by Goldmund (Keith Kenniff), the piano melody being very reminiscent of Anthony Phillips’ Death of a Knight from Henry: Portrait from Tudor Times (from the album The Geese and The Ghost), before drifting into a dream-state with seaside, night-time crickets and Morse Code pulses. Most of the remixes are by artists who have done work strongly connected with outdoor environs and water (as in the Flaming Pines label Rivers Home series), like Marcus Fischer, Taylor Deupree and Simon Scott (to name a few). The character of this disc ranges from contemplative to glitchy (FourColor) to playfully rhythmic (as in Loscil’s remix). The remix by Steve Wilkes includes the first HearCapeCod recording made in Truro at Corn Hill Beach in the summer of 2002. The CD closes with a collaboration of FourColor and SoundSignal (Wilkes) and is the most melodic and rhythmic of the tracks of the album. This CD forms a strong connection to the foundation provided by Wilkes’ research and recordings. As much as I’m tempted to suggest that this CD be made available separately, after spending time with the entire set, it is actually a quite inseparable part of the whole. CD 3 Upstream, is a song cycle by the duo Fordham Wilkes (Ginny Fordham: vocals, Steve Wilkes: drums with Crit Harmon: guitars and Keiichi Sugimoto: guitars) and is inspired by years of memories of time on Cape Cod and it is the most personal of the three discs. Fond recollections of places run deep for many and they have different effects on people. This is where the project transforms from being objective (CD 1) to the most reflective and personal (while avoiding sentimentality). The album has a sense of welcoming and ease, enjoying summer breezes, wading in tidal pools, walking in sanctuaries or along beaches. There is no heavy foreboding or hand-wringing of what was or could be; the feeling is that of the now and hopefulness, and Ginny Fordham’s voice brings a relaxing calm to the album. Gates of Summer opens CD3 and is forms an instrumental and melodic transition from the last track of CD2. The Language of Birds plays rhythmically with a juxtaposition and syncopation of the instrumentation and avian field recordings. The ever-present drone of automobile traffic is also a reality of summers on The Cape (whether passing over the Sagamore or Bourne bridges before necking down to Route 6 or at the half-way point to Provincetown, in Eastham) and these sounds are merged with fleeting views to salt marshes in the pensive GP Road Resonator. As in CD 1, there are songs of Land as well as Water, as in Dive Down and Upstream (as much a metaphor for returning to and rebirth of the area as it is the traffic on Route 6 that one is “swimming” against!). CD 3 is also a reflection of CD 1’s A Year, The Cape in song over the course of a single circumnavigation of our Earth around the Sun. As the album progresses through the summer and into the end of a year (June, Shifting Sand and Fog) it grows more contemplative with the advancing of the calendar, melding dreams with reality. Each Spring many look forward the approaching time outside and then seemingly in the blink of an eye, Summer is over. The album closes with The Message, an inspiration left in a voicemail, which ultimately is the beacon announcing the sense of place of The Cape that inspired the HearCapeCod project. LP Time: about 43 minutes. Digital Time*: about 49 minutes with Track 8*. Improvisation is about taking risks, experimenting and responding to the immediate results. It is the outcome of the instantaneous transition from thought to motion, and then to sound. It sometimes takes practice, and it requires chemistry between the artists; the kind of vibe evident between Marcus Fischer and Ted Laderas (aka The-OO-Ray). Music can yield a far timelier reward compared to other slower [art] forms, like in architecture or science, where the results of research and collaboration can often take years to behold. This has been a busy year for Marcus Fischer with at least five published recordings, touring, and new projects in the works. I’ve certainly enjoyed all of them, solo and collaborative. 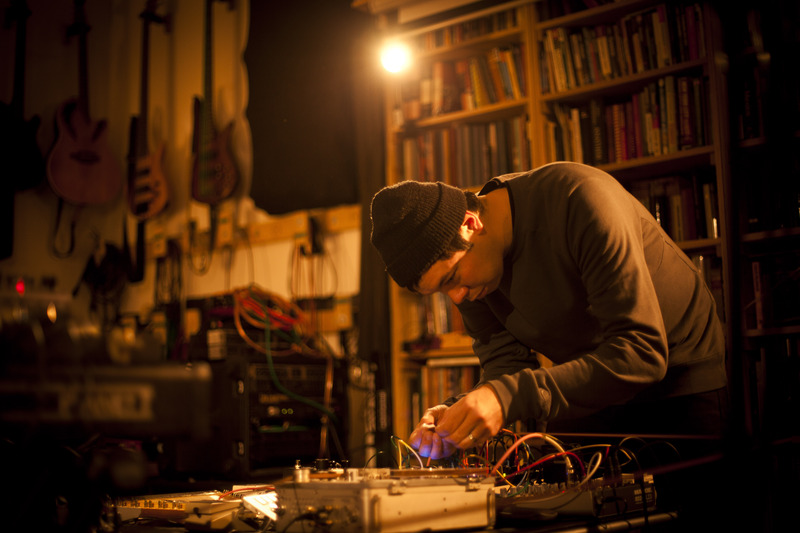 It is thanks to Fischer’s work that I have become familiar with Ted Laderas (The OO-Ray: self-professed on his Twitter bio “Half Scientist, Half Cellist, All Shoegazer”) and his electro-acoustic chamber-drones. Tessellations is the result of a series of long-form improvisations between the Fischer and Laderas. It was commissioned by the Optic Echo label in 2011. The instrumentation is largely stringed (acoustic and electric guitars, cello, lap harp) with percussion, loops, processing and minimal synthesizers. The album has a dynamic richness with a combination of soothing observation and introspection. I also appreciate that this is an album of largely non-electronic instrumentation, not necessarily a rejection of sequenced analog or digital electronics, but a return to earlier tangible instrumental roots, and a sense of the ageless. It kind of takes me back to some of Kraftwerk’s oft-forgotten earlier works from Kraftwerk 1 and 2, and Ralf and Florian; like the guitar portions of Tongebirge (Mountain of Sound) from 1973. The album opens with belong, rising like the sun on a dewy morn; crisp and hopeful with a gentleness that avoids any sense of melancholy. Stark and mysterious is the ambience of cold spring with OO-Ray’s cello seeking the edges, and hints of Harold Budd’s Boy About 10 from the album By The Dawn’s Early Light. The largo metronomic of the bass line maintains the focus of bokeh as cello, keyboards and other instrumentation blurs the musical depth of field. The shifting of sounds, interlocking, matching and then contrasting (much like a moiré pattern) is the sense presented in fourier, which is perhaps the most densely packed and expansive of the tracks. By contrast, unfold is perhaps the most peaceful track on the album, a private [waterside] contemplation with gently flowing cello, meandering lap harp layered and a soft droning veil. Then, the mystical and shimmering reverb of ghost lights emerges, and is reminiscent of the recent Unrecognizable Now album (Fischer’s collaboration with Matt Jones, KESH018) Two Rooms, with shifting chords and bowed strings (and has some of the sound I noted earlier in Tongebirge). tessellate is the longest (about 10 minutes) and most subtle of the tracks on the album (titled tessellation on the download). It has the most nuanced transitions, with Fischer and Laderas trading themes and responses, and weaving phrases back into the fabric of the piece. It brings the LP to a placid close. *music for caverns is the bonus track with the digital download, and is a warm postlude to the day that started with belong, and in some respects is similar to the closing tracks of Eno, Lanois & Eno’s album, Apollo: Atmospheres and Soundtracks—one of my favorite of Eno’s collaborative works. Marcus Fischer + The OO-Ray have deftly assembled in their collaborative improvisational work both a cohesive sonic realism, and impressionistic vision with a timeless authenticity. Beneath Peaks (Autistici’s debut release on Hibernate Recordings) is an interpretive sound narrative of a walking and camping tour through the Peak District in the central UK; a luminous and expansive journey with a strong sense of place. The region is geologically diverse with moorland plateaus, expanses of millstone grit escarpments, limestone and demarking zones at the edges of the long-ago eroded strata. I have been fortunate to take long walks in similar places: Devon (The Burrows in Saunton) and on Exmoor in the southwestern UK, and Beneath Peaks is certainly an enticement to travel to this varied pastoral upland region. Even before the music, I was struck by the hues, varying landscape and seemingly endless sky in the cover photo (quite similar to Exmoor in some respects). The photo is also illustrative of Autistici’s work, which ranges from outwardly expansive to inwardly minute explorations; the literal and abstract in a landscape that is both known yet still mysterious. Instrumentation throughout the album is both recognizable and veiled, and includes piano, guitar, synthesizer and electronics, in addition to sculpted fragments of extensive field recordings captured during the trip (processed with the help of Christopher Hipgrave’s software module AMBIENT). Additional guitar on Edge Over Millstone View was provided by Erik Schoster. Beneath Peaks is book-ended by two sleep-states: an awakening (the beginning of the journey at a campsite named Fieldhead) and a closing to slumber and inward contemplation (at the ancient Carl Wark). Throughout there is a deep sense of observation and contemplation, both in the literal field recordings and abstract sonic interpretations of the journey. Asleep Beneath Nests (Fieldhead) is a deftly woven tapestry of field, avian and human sounds, rising with the sun (while human slumbers). Edall is the sound of breathing and pulsing; movement through this timeless area. Edall is a 16th century variant spelling of the village of Edale and was once known as the “Valley of the River Noe”; the start of the Pennine Way, a trail in this district. Mam Tor Soarers’ Workshop; starts in what appears to be in a woodworker’s shop. This is a region known for hang and para-gliding. As this track progresses, it transitions from being grounded to having a sense of weightlessness. The latter section (and I am speculating) appears to be a bit of an homage to Raymond Scott’s rhythmic and melodic electronic Bass-Line Generator (of 1967). Styx is a brief and quiet transition into Edge Over Millstone View. The sound is sharp and panoramic in contrast to other areas of rolling pasturelands elsewhere in this region (a reference to the geology, I speculate). The rocky echoed sounds of Padley Gorge give the sense of passing through the deep narrow wooded valley near the village of Grindleford. Burbage Brook is at the base of the gorge. Noe (Upper Booth) is a small tributary to the River Derwent and forms a sonic respite before a pulsating encounter with Mulgrave’s Dining-Room. Aidale (I believe, another early variant spelling of the village Edale) is at first, a delightful contrast to Mulgrave’s; a meandering solo piano, which then drifts into an altered dream-state and transitions to the apparent sounds of traffic passing or is it time bending? Peveril’s Open Door brings us to the environs of Castleton and the nearby Peveril Castle, which overlooks the village with sounds of birds, nearby waterway and the piano returns. The end of the journey is Sleep State For Carl Wark, the rocky promontory in Hatersage Moor (believed to be the site of an Iron Age hill fort). It is here that memories of the distant past flow into and blend with the present, and sleep returns with music box and strings; the end of a captivating journey. Autistici is Sheffield-based (UK) sound artist David Newman. He is the curator of the Audiobulb (where I discovered the marvelous work of Monty Adkins) and Audiomoves record labels. To date, Autistici has released a number of acclaimed albums on the 12k, Home Normal and Keshhhhhh labels, amongst others. Updated sound files will be posted when available.